Prior to the late 1950s, the exclamation point was alive and well in advertising. 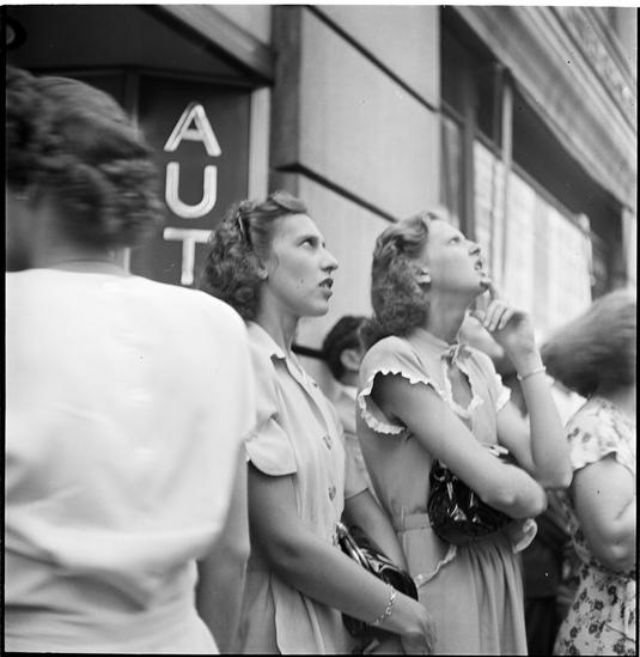 If we look back to 1940s war era, grabbing the public’s attention was of utmost importance, since the war effort was in dire need of help from men and women alike. Enter: the exclamation point (or mark, whichever you prefer). We’re not guilting you at all! Commerce is alive and well back home! After the war, America was in a good place to start amassing wealth again—namely with spending on cars and toys for the kids. You can do it all when you rent a Chevrolet! No guilt trip here, dad! It wasn’t until around 1959 when we started to see the power of the period again, namely with the Doyle Dane Bernbach “Think Small” Volkswagen campaign. The exclamation point has had steady appearances since then, but lately we’ve been seeing the preference for periods to get across a poignant statement—and often no period at all. Print campaign by David, Argentina for Don Satur, 2017. Wieden + Kennedy for Nike, 2018. Imagine this ad with an exclamation point. How would that change the message for you? swing by the Museum of the City of New York to check out Stanley Kubrick's early photography for LOOK Magazine in their exhibit Through a Different Lens: Stanley Kubrick Photographs. Kubrick for LOOK Magazine, 1945-1950. In addition to seeing the early beginnings of his thought process and stylistic sensibilities, you'll find rarely known tidbits, like his capturing of innovative advertising campaigns that would be fitting, even today. Take this 1947 campaign for Peter Pan Bras, in which a live model posed in front of their product billboard for spectators on the street to watch in awe. A must-read for your spare time—or anytime. 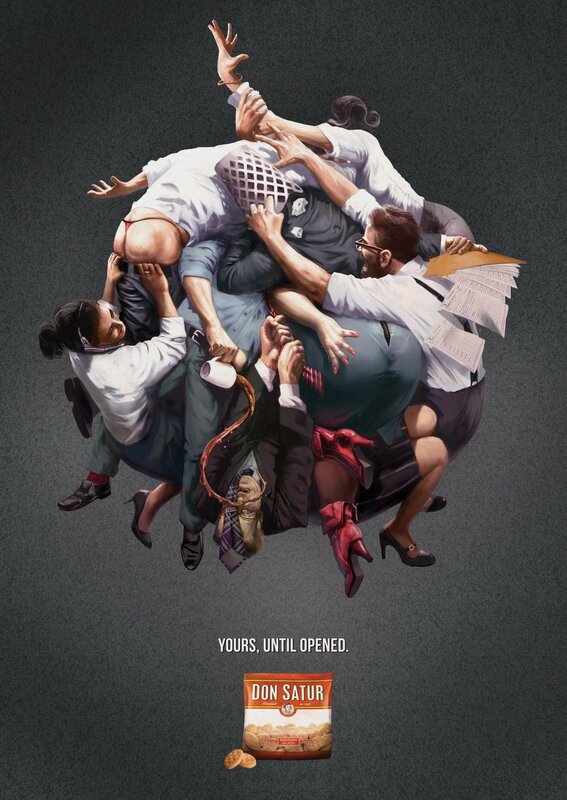 "Ad agencies no longer seem to know what they are for. Their executives like to declare that they don’t work in advertising, since 'ads' are associated with a pre-internet world. Yet when asked to say what it is they actually do, they become vague ('communication') or grandiose ('create culture'). The industry is Balkanised, the engineers talking a different language to the storytellers. Scott Galloway’s lecture articulates the worst fear of the latter: that there is no need for them any more. Yet not everyone is ready to accept redundancy." without being bombarded by advertisements and branding. And whether you realize it or not, the messages big business is sending you every day are leaving an impression -- although not always positive in nature. The advertising industry has always fascinated the consumer. Since the 1960s, consumers have been wise to the tricks of the trade. But nevertheless, advertisers know human nature, and they know how to tap into it for commercial gain (no pun intended). As these 7 interesting facts about advertising in America demonstrate, the industry itself is every bit as fascinating as the ads it creates. Swedish furniture retailer IKEA took the bold step of using social diversity to sell its products, at a time when commercials were the domain of the quintessential American family. The 1994 ad featured a male couple shopping for a dining room table. Sadly, the backlash included death threats against IKEA stores, and the commercial was pulled shortly after it aired. Nevertheless, the Swedish company received lots of praise -- paving the way for more diversity on television. According to Statista, revenue from online advertising in the United States was just a little over $8 billion a year. Fast forward to 2017, and that figure stood at $88 billion. A combination of social media, online video and the increasing use of mobile devices are believed to be responsible for this exceptional rate of growth. The original script for Steven Spielberg's E.T. : The Extra Terrestrial included a scene in which Elliot lures the little alien from the woods with a trail of M&Ms. This was a great example of product placement that worked perfectly with the storyline. However, confectionery giant Mars thought the alien was ugly, and refused to allow their product to be associated with it. Instead, Reese's Pieces stepped up to the plate -- and enjoyed a sales increase of 65 percent shortly after the movie's release. Until Ford launched its famous Model T production car, motor vehicles were very expensive -- and beyond the budget of the masses. As a result, roads in America were relatively quiet places. Of course, billboards had been around for decades in 1908, but the sudden increase in traffic created by Ford's groundbreaking vehicle increased the demand for them significantly. The Brooklyn Dodgers were taking on the Philadelphia Eagles in New York. The year was 1941, and the channel was WNBT (an NBC subsidiary). The simple TV commercial features a clock superimposed onto a map of America, showing the time on the east coast. The narrator says: "America runs on Bulova time." This simple ad for a watch company changed the world. Max Luhrmann's 2004 commercial for Chanel had a bigger budget than many Hollywood movies in production at the time. The two-minute ad features Australian actress Nicole Kidman as she struggles to cope with the constant attention of Paparazzi. In scenes similar to those in Kidman's Moulin Rouge, she jumps into a taxi to escape the photographers, and meets a young writer with whom she falls in love. The commercial purportedly cost $33 million to produce -- which included Kidman's $3 million fee. When commercials for watches first started appearing on our TVs, advertisers set the time depicted on their products to 10:10. Doing this spread the hour and minute hands equidistantly to showcase the brand name. In an effort to set themselves apart from the crowd, Apple now sets the time on its devices to 10:09. These seven mind-blowing facts demonstrate that the industry itself is just as fascinating as the campaigns it creates. coffee has been promoted as the foremost social lubricant available. 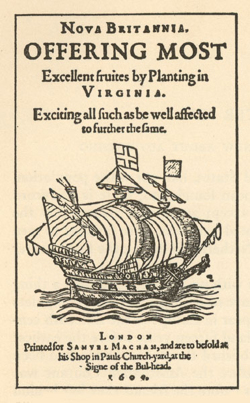 This pamphlet from England waxes lyrical about the benefits of this new, exotic berry, which 'groweth upon little trees' and 'quickens the spirits'. The language and style have changed greatly since then, but the idea that coffee is some magical brew that will bring you friends, lovers and improve your life has remained constant. From 1950s black and white promises of catching that girl, to totally up-to-date YouTube videos designed to 'go viral' by painting coffee as the ultimate social network, you've always been told just how great coffee can be for your social life, your health and your happiness. Coffee began the 20th Century with a fight on its hands. A company called Postum ran a $1.5 million smear campaign against coffee, citing health risks. Postum promoted its own product, a coffee substitute based on grain. However, in a real-life case of "if you can't beat 'em, join 'em", Postum eventually jumped on the coffee bandwagon, buying Maxwell House. 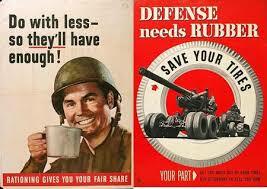 Postum went on to become General Foods Corp.
Having survived the propaganda attack, coffee had another boost in 1919. Prohibition meant no alcohol, and with no bars to hang out in, all of a sudden, the coffee house was on the rise. Advertising followed suit, with companies like Maxwell House running huge campaigns. Their slogan was 'Good to the Last Drop', and they controversially claimed these were the words of President Theodore Roosevelt. Back in the 17th century, coffee was supposed to be good for your digestion. By 1942, racing driver Wilbur Shaw was telling America that 'Coffee wins races for me,' and actress Dorothy Lamour claimed that 'Coffee keeps me glamorous.' Of course, such claims are hard to make in advertising today, so it's no wonder modern marketing focuses on the social and happiness aspects, rather than health claims which could potentially be debunked. In 1952, a Madison Avenue ad agency by the name of Federal Advertising Agency coined the phrase "Coffee Break" for the Pan American Coffee Bureau, launching a radio, newspaper, and magazine campaign. According to one source, "The bureau gave a name and official sanction to a practice that had begun during the war in defense plants, when time off for coffee gave workers a needed moment of relaxation along with a caffeine jolt." 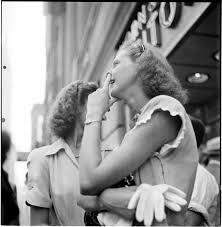 It was so well publicized that it became a part of our daily language. So many advertising campaigns for coffee are based on relationships, marriage, and even enduring love affairs. In the UK, the Nescafe Gold Blend TV adverts in the 1980s depicted a blossoming relationship between a couple, which lasted for 12 'episodes', or 45 second installments. The ads were so popular that each new installment garnered immediate media attention, and catapulted the stars, Anthony Head and Sharon Maughan to fame. The campaign was adjusted for the American audience, and the slightly different brand name of 'Taster's Choice', and was just as popular. Our love affair with coffee began way before this though. Look at this ad from the Pan-American Coffee Bureau, the company that apparently first coined the phrase 'coffee break'. Without being too overt, the ad heavily implies that you can win a girl over by inviting her for a coffee break. A more risqué addition to the coffee ad archives is this saucy exhibit from Chase & Sanborn. While this might have been acceptable in the 1950s, you can imagine that this would not go down well with today's audiences. Today's marketing world is a far cry from the wordy pamphlet of the past. Lavazza have taken the promises of coffee to new levels with a viral advertising campaign that combines a reworking of a much-loved song, with the idea that coffee is the real social network. Ironically, the coffee giant is using those much-maligned social networks to get its message across; make of that what you will. With the slogan 'Born Social in 1895', this campaign sums up the history of coffee advertising succinctly. Coffee was first promoted as a social lubricant with health benefits, then fast became the ultimate pick-me-up, and is now an irreplaceable part of Western recreational and social culture. Where will coffee advertising go from here? The best brands are instantly recognizable. The moment you see them on a computer screen or in a grocery store, certain mental images and emotions are evoked. And some of these brands are so strong, even a color or a particular font can identify them in the minds of consumers. But this level of brand recognition is no accident; it's the result of a strong marketing proposition that gets into the hearts and minds of the public. These five iconic companies developed a killer brand -- and each one now transcends its own particular industry. Coca Cola was developed by pharmacist Dr. John Pemberton in Atlanta, Georgia. He made a jug of the soda in his home, and carried it down the street to his local pharmacy. The store owner was so impressed, he immediately agreed to sell it for five cents a glass -- and the rest is history. First ad for Coca-Cola, 1886. Pemberton advertised in local newspapers, and advertised his new drink outside stores using hand-painted signs made with oilcloth. Crucially, the trademark white logo on a red background was created by Frank M. Robinson in 1886. But it wasn't until a marketing professional bought Coca Cola from Pemberton that the brand began to develop a life of its own. Asa Candler bought the tiny soft drinks company, and plowed $11,000 into advertising. At first, branded soda fountains, pencils, clocks, and calendars were used to build the brand's national identity. 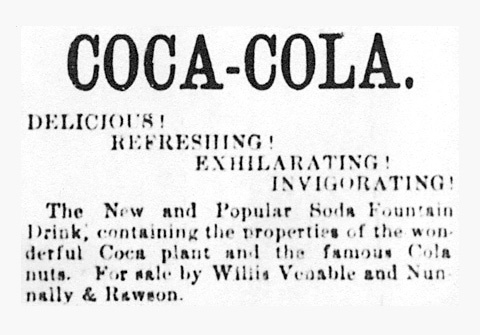 By 1910, Coca Cola had a marketing budget of more than $1 million. The company began to advertise on huge billboards, and it wasn't long before expensive radio commercials were being played across America. The Coca Cola brand has enjoyed several milestone moments over the years. In 1931, the iconic Christmas illustration put Santa in a Coca Cola-red suit. The first television commercial aired in 1950, and the company became one of the pioneers of celebrity endorsements shortly after -- thanks to collaborations with the likes of Joan Crawford and Aretha Franklin. The first Coca Cola bottle was designed in 1916. The iconic contoured bottle was an attempt to distinguish the brand from the many competitors that emerged during the preceding 20 years. This shape became as much a part of the brand as the famous logo, and remained in production until 1955 -- when it was tweaked for a new age. Apple's Macintosh personal computer was launched in 1984 -- via a Super Bowl TV commercial the company's directors hated. Indeed, Walter Isaacson described the ad as "The worst commercial they had ever seen." Directed by Ridley Scott, the commercial portrayed a bleak, dystopian future in the mold of the one created by George Orwell in his famous novel "1984." The message was one of free-thinking, individuality and standing out from the crowd -- and it worked spectacularly. Apple went on to sell 72,000 units in the following 100 days, which was twice the board's forecast. Despite several bumps in the road -- which included the infamous "Lemmings" ad and "The power to be your best slogan -- Apple had created a strong brand. That partially eaten apple stood for more than a simple home computer; it stood for style, free-thinking and innovation. When the digital age arrived in the early 1990s, two decades of brand-building was vindicated in spectacular style. Salesman Ray Kroc was sold on the McDonald's brand the moment he walked into the San Bernardino restaurant in search of a sale. He loved the concept so much, he negotiated a franchise deal to open one of his own. Kroc eventually bought the entire company from founders Richard and Maurice McDonald. 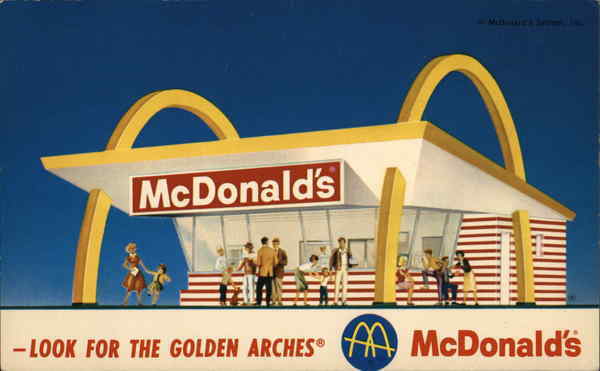 Kroc was captivated by the glowing "Golden Arches," and he knew that the brand alone would be enough to build an empire. The premise behind this global brand is a relatively simple one: Good burgers served quickly. That, along with that famous logo makes this one of the most successful examples of aggressive branding in the history of modern consumerism. Founded by brothers Walt and Roy Disney in 1923, The Walt Disney Company endured a tumultuous first few years of production. Walt's Oswald the Lucky Rabbit was a commercial hit, and made the brothers a lot of money. However, the cartoon's distributor had sneakily drawn up a contract gave him the rights to the character. Walt and his brother lost control over their own creation, and the Walt Disney Studio was forced to start again. Walt created the character of Mickey Mouse in his Hyperion Avenue studio in Hollywood. Steamboat Willie was the short film that launched a cartoon superstar -- and one of today's most recognizable brands. The Walt Disney Company has built its brand on animation of the highest quality. Magical worlds of make-believe and family-friendly entertainment are now synonymous with Disney. And to this day, something as simple as Walt's own signature is the mark of quality entertainment for people of all ages. Founded in 1964 in Eugene, Oregon, Nike is now the world's most recognizable sportswear brand. 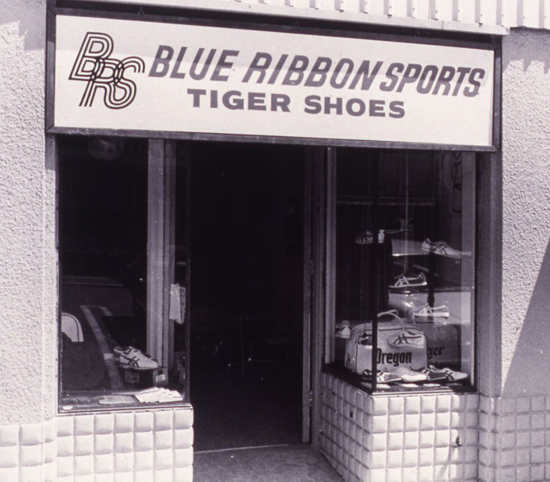 The original company was called Blue Ribbon Sports, and it sold running shoes imported from Japanese company Onitsuka Tiger. Founder Philip Knight sold the shoes out of the back of his car at athletics meetings across America, and within 18 months he and his partner William J. Bowerman had a small workforce and a large retail space of their own. In 1971, the owners of Blue Ribbon Sports realized that they needed to rebrand in order to take the next step -- selling their shoes across America. They began to design their own shoes, and changed the company name to Nike, after the Greek goddess of victory. Graphic design student Carolyn Davidson was paid the princely sum of just $35 for her now iconic "swoosh" icon. Memorial Day, originally called Decoration Day, originated after the American Civil War. Before it became an official federal holiday in 1971 in honor of service men and women who gave their lives in service, American advertising had long connected the day of remembrance with name brands. A great example of this is Seagram's Beverage Company who, in the mid-1960s, created a backyard barbecue guide complete with drink recipes, party tips, and more ideas for entertaining your favorite people. Joe Kaufman, a notable commercial children's book illustrator, created the colorful and uplifting imagery of the American family. Since then, it is debatable that the original intent of the holiday has turned into a holiday similar to the 4th of July or even Labor Day, where Americans can enjoy a day to rest from the long workweek and be with their families and friends. Regardless of how it is celebrated, it's undeniable that advertising plays a vital part in this longtime tradition. The first Photoshopped image was of co-creator John Knoll's wife Jennifer while they were on vacation in Tahiti. The story goes like so: John and Jennifer traveled to Bora Bora after wrapping up work on the live action/animated film Who Framed Roger Rabbit, and John snapped this photo just before proposing to her. (Anyone in the animated/digital arts fields knows how long those hours usually are, and destination getaways are a must. ) Post-vacation, John's brother Thomas was working on software that was similar to the "Pixar Machine" photo manipulation technology that John had encountered at ILM (Industrial Light & Magic), yet didn't cost thousands of dollars nor required a specially-trained operator. With their new hobby in motion, they needed more digital images for their demos, which were naturally scarce at the time. So while visiting friends at Apple's Advanced Technology Group lab, they were able to use their rare flatbed scanner to scan John's 4x6 photo of his wife—which is the only photograph he had available at the time. Now ILM's Chief Creative Officer, John has greatly expanded his digital advancements since then. That being said, it's important to consider how much the Knoll brothers' innovation has become vital to the world's creative fields—and advertising—forever. Sometimes the best inventions happen when they start out as a hobby. More on John's story (and a recreation of his demo) here. "It was a good image to do demos with," Knoll recalls. "It was pleasing to look at and there were a whole bunch of things you could do with that image technically." On this day in 2014, ad man (and co-founder of AMV BBDO) David Abbott had passed away. 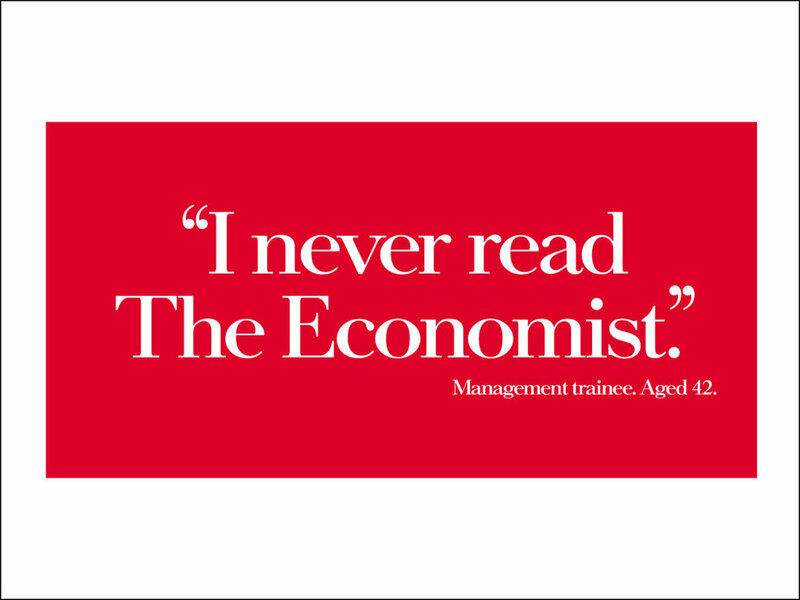 For those who don't know, he was the man responsible for the eye-catching red and white print ads that make The Economist iconic. When David Abbott was hired to design ads for a small British newspaper, he captured the essence of their product in a simple, memorable way. Since then, this formula has been used time and again for hard-hitting cultural messages that grab readers' attention and delivers thought-provoking insight all at once. Can you think of other brands who use this simple, tried-and-true formula? Hide your mothers—the Colonel is coming. As of 2017, KFC boasts 21,000+ locations around the world. Founded in 1930 out of North Corbin, Kentucky, the Colonel has been charming us all for what feels like a lifetime. What may not be widely known is that Colonel Harland Sanders was, in fact, a real person who actually started the chain. The governor of Kentucky during Sanders' time had even designated him a colonel. More about his life here. Have you ever heard of the industrial musical? Neither have we...until the Tribeca Film Festival, that is. 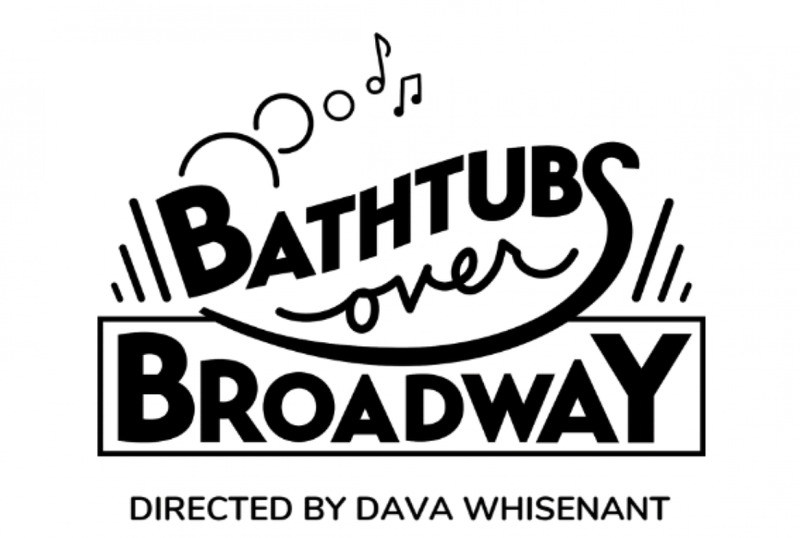 The Tribeca 2018 Albert Maysles Award for Best New Documentary Director went to Bathtubs Over Broadway, centering on the growth and fulfillment of former comedy writer of The Late Show With David Letterman, Steve Young. Young was a longtime fan of obscure "industrial musical" records which he wrote into the Letterman program for a segment where they lightheartedly poked fun at these vintage records. Directed by Dava Whisenant, who is a former editor at The Late Show, takes the audience through Young's quest and ultimate dream of meeting, interacting with, and ultimately honoring the people who made these musicals happen. As the documentary progresses, you can feel the shift in Young's life from the ending of the Late Show and the shift from a fun hobby to fully immersing himself in the culture and people he's investigating. And what turned into a 2013 book was also a filmed experience for us to see it all after the last curtain call. There's this entire world of advertising-meets-entertainment that the world at large did not know about and it's an intriguing adventure from the get-go. Created for NY Eve at the Benjablums 12/31/58. 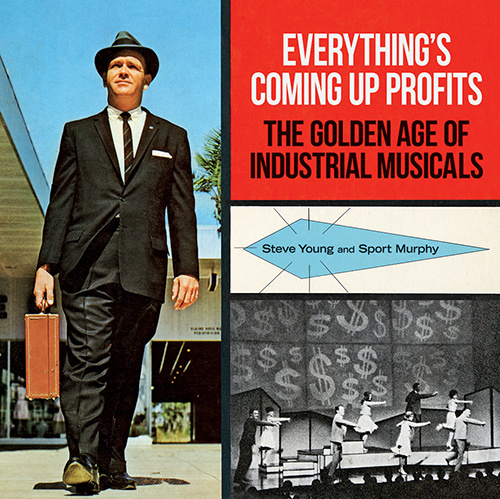 Recording of My Bathroom is from an industrial musical called, The Bathrooms are Coming," produced by the American Standard Company in 1969 and included in the book and accompanying CD, "Everything's Coming Up Profits: The Golden Age of Industrial Musicals." From Xerox to bathroom fixtures, the limits are endless when it comes to advertising and the musical numbers you can create for them. It was a small pocket of time before digital when companies showed their sales people rewards through high-production entertainment to get them excited for another quarter or year of selling. The line between advertising and entertainment is often blurred, and that's never been more true today. Though a few shows are still in existence today (like Walmart), it's still not really talked about in popular culture. And most of the records that Young collected are rare and often the last one in existence, it's amazing that he and a few other individuals thought to help preserve such important history in advertising and show business. What often helped pay the bills for entertainers also helped them do what they love when other jobs were scarce. For creatives and professionals in the industry, this film and book are a must-see and must-read for a fascinating era of pride and energy that still has roots in the business today. Look how far we've come. In the news: a federal judge ruled Tuesday that the U.S. must keep DACA and accept new applications. Next up: Trump's Travel Ban goes before the Supreme Court today. To align with these momentous decisions, we're taking a look back at Lin-Manuel Miranda's 2017 Hamilton Mixtape: Immigrants, which was inspired by "Yorktown" from Hamilton. In addition to a campaign benefiting the Immigrants: We Get The Job Done Coalition in the form of a contest, his 2015 hit musical was started by a 2009 mixtape he had created. Then, another mixtape of those performances was recorded, followed by this 2017 release focusing on the plight of refugees. More on this 2017 story here. IF YOU DIDN'T KNOW, It's 4/20. Marijuana has come a long way. Before being openly celebrated annually on this day alongside instantly gratifying munchies and the greasiest fast food hits, it was widely difficult to obtain because it was mostly imported. When raw botanical medicines became scarce during WWI, Americans turned to growing at home. Here's a 1917 print ad which supports American-grown cannabis as a near-equal substitution to the foreign variety. For a deeper dive, visit the Antique Cannabis Book for even more Victory Ads and other vintage collections. And for extra credit, check out the self-proclaimed "World's First Cannabis Marketing Agency." Oh, How the Turntables Have Turned. Audio brand Technics put together an all-star ensemble of the world's top turntablists (DJs) like DJ Qbert, DJ Kentaro, and 2017 DMC World DJ Championship winner DJ Rena. (Rena is the youngest to have won the title at just 12 years old.) Check out this orchestra of talent where each artist is using the iconic Technics SL-1200 series turntable. For hip hop fans new and die-hard, going to scratch sessions was a big part of your social life. From the early beginnings à la Grandmaster Flash and his student Grand Wizzard Theodore (who is widely accepted as the inventor of scratching), the mid-to-late 70s was the birth of an epic time in music history. Once DJing caught on, getting your hands on a turntable, building your record collection, and starting your own crew was the dreams of so many young kids. Ads like these would keep such dreams alive. For more on the beginnings, check out the reimagining of that time period with Netflix and Baz Luhrmann's two-part musical drama series The Get Down, which covers a time in New York's history where the city was on the brink of bankruptcy and concurrently gave birth to hip hop, disco, and punk. Though the series was short-lived, it put a spotlight on a scene that's never really stopped. If you’re a working creative in the industry, you’ve most likely created your fair share of banner ads. If you don’t remember or weren’t around—ever wonder what the first banner ad looked like? According to a 2017 article by The Atlantic, the widely agreed upon first banner ad was a part of a 1994 campaign called "You Will" for AT&T. Hosted by HotWired, it had a 44% clickthrough. "The ad set off a chain reaction that altered the course of the advertising industry—and any other industry that overlapped with it. ('It’s almost like a prank that was played by the technology industry on the media industry 20 years ago,' Chris Dixon, the tech investor, told The New York Times in 2014.)'" Bringing users from the banner ad to a landing page was a landmark event for advertisers. It got them to see what else customers would do. Hence, how ever-present they are today. Of course, there has been backlash ever since, due to the eventual creation of "pop-up" ads that are even more disruptive. "The person who created the first pop-up ad is similarly sheepish about what he wrought. 'I’m sorry,' Ethan Zuckerman, who coded the first pop-up ad, wrote for The Atlantic in 2014. 'Our intentions were good.'" For more reading, visit the original article from The Atlantic. For the latest on what AT&T is cooking up, head here. Meme, according to wiki: The word meme was coined by Richard Dawkins in his 1976 book The Selfish Gene as an attempt to explain the way cultural information spreads; Internet memes are a subset of this general meme concept specific to the culture and environment of the Internet. If you're like most people these days, memes are such a part of your daily routine that sometimes you don't catch yourself sending one to your friend until the reply with a fitting emoji. 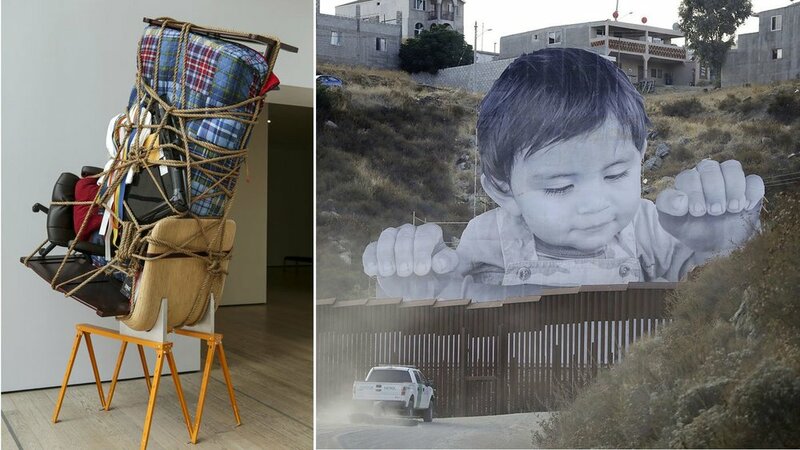 The idea of a meme is really an idea itself: or a concept, activity, catchphrase, or media that spreads with humorous purpose, often in mockery. If you remember, early memes with riddled with intentional misspellings, cute animals in jest, and even as GIFs. It would be easy to say that the first memes were emoticons, but if you're in the camp of a meme having to be highly influential, then we'd have to go with "All Your Base Are Belong to Us" from the SEGA Genesis 16-bit game, Zero Wing. A bad translation turns into a catchphrase that morphed into several memorable spinoffs. In 2013-4, advertising was also inspiring meme culture. "That’s not how any of this works." Leo Burnett Chicago, 2014 “Beatrice” spot for Esurance. According to an interview with Adweek, the creators were prepping their own GIFs but the internet beat them to the punch. After its initial run, it regained traction with reactions to the 2016 election. As of this year, memes have largely taken the form of tweets, Instagram posts and the like. What seems to be sticking is an empathic message of "that is so me right now" to elicit feelings of rapport and common ground about anything under the sun, often at the expense of celebrities, public figures, and the like. It's constant, addictive elixir that heals the banality of everyday life, so to speak. This leads us to meme culture connecting to the idea of self-branding, which is of course, not a new notion but has been packaged by social media as something to strive for. The 2018 Tribeca Film Festival is set to screen The American Meme (a play on the notion of the American Dream) further supports how impactful the spread of catchphrases and images are — and continue to be. Written and directed by Bert Marcus, it also takes it a step further by exposing the often unglamorous life of major internet influencers while they desperately try to gain or maintain the spotlight with their followers. Self-branding takes on many forms and is, in and of itself, a major aspect of advertising. The selling of ideas and identity in exchange for notoriety or profit is still at the helm of popular culture, and the social impact is a direct commentary on our collective identity and changing values. But attributing meme culture to fame and money would be too simple. According to a 2011 Smithsonian Magazine article What Defines a Meme by James Gleick, the basis for these sparks of lightning-fast pieces of information come down to a scientific level of understanding. "Memes emerge in brains and travel outward, establishing beachheads on paper and celluloid and silicon and anywhere else information can go. They are not to be thought of as elementary particles but as organisms. The number three is not a meme; nor is the color blue, nor any simple thought, any more than a single nucleotide can be a gene. Memes are complex units, distinct and memorable—units with staying power." March of Our Lives, a movement to speak out against existing gun laws and to demand safety first, is scheduled nationally for March 24th. 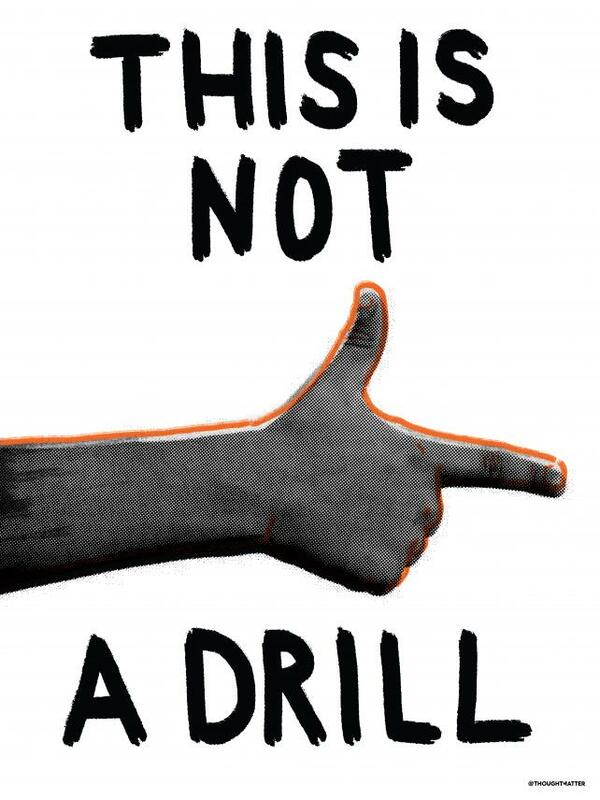 Ad Age partnered with The Gun Safety Alliance to gather posters and social media imagery from the students themselves, filled with powerful messages of immediate reform. This isn't the first time in our nation's history that we've had hard-hitting messages about gun reform. Here are a few from 1968 which catalyzed the gun debate, in response to the 1963 shooting of JFK (and subsequently the Robert F. Kennedy assassination). 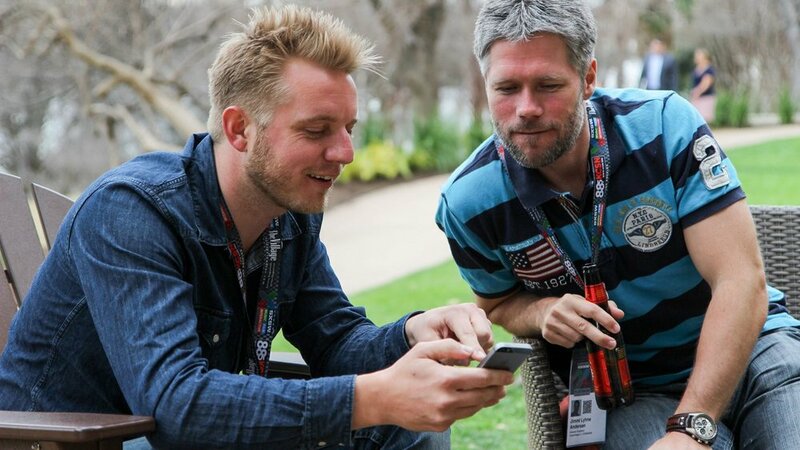 2017 marked the 30th anniversary of SxSW, an annual multifarious festival celebrating film, interactive media, music, and conferences that take place in mid-March hosted by the city of Austin, TX. What started out to be a focus on independent music and art has branched out to represent the ingenuity of all creatives. Advertising continues to represent the sponsorship of such talent, taking form in every consumer touchpoint from out-of-home marketing to intricately planned activations that showcase not only the diversity of brilliant ideas, but the endless contexts with which strategic thinking plays a key role for shaping our culture and economy. Program for first South By Southwest Festival, c. 1987. Setting the stage for successful festivals to come, and inspiring many more. The first South By Crew, which helped countless creatives come together for a festival that has only grown and evolved in scope and cultural relevance. Check out more history at SxSW. This year's SxSW Luna Gamechanger award goes to First Match by Olivia Newman, a narrative that centers on female perseverance in the face of great odds in a coming-of-age wrestling film. This is a still from a 2018 Oculus film that debuted at this year's SxSW titled "The Evolution of Testicles", which is a compelling VR film created by director Ryan Hartsell for the Male Cancer Awareness Campaign. This is a great example of how VR can be used to generate empathy for social change, revealing the positive impacts of technology. More here. The NBC Sports Lounge at SxSW 2018, representing continued excellence in brand experience, activation, and engagement. ©2017 The Museum of Advertising, a registered trademark. All rights reserved. All works and images are properties of their respective owners unless otherwise stated.